Pip had lessons from previous instructors but due to work pressure took a break from driving. She asked me to help her with a "refresher course" of just 10 hours of driving. She passed 1st time with just 4 minors. "Paul is a wonderful driving instructor. He gave me the confidence and the techniques which enabled me to pass my test first time. I'm thrilled!" With a very limited time to learn to drive and pass a test, I did an intensive course with Paul, which involved around 25 hours of lessons. 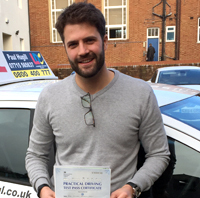 Paul has an excellent teaching style, and explained and demonstrated everything in a way that allowed me to very quickly and safely take ownership of driving. He also offered techniques for remaining calm and focussed before the test, which was hugely beneficial. I passed first time, and can highly recommend Paul.